What we really needed was a brochure that featured the all three of the Wisconsin Chapters of the NCT. After I met with Bill Menke on Tuesday, I started working on such a brochure. It is an 8.5 x 11 Tri-fold brochure. 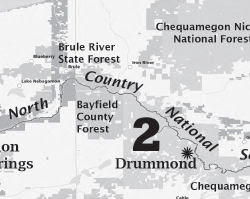 The Brochure is designed to help recruit people to work on the trail and it highlights the 110 mile continuous section in Wisconsin. The link appears to be broken, Joan. Worked for me???? try again and let me know?? Great idea and well put together brochure. Hope it brings in more people for you. Works now. Must've been my internet connection. A great looking brochure, nice work to the WI chapters.